Uh, what? Did these people see the same film I did? When I asked friends who saw it they all like it. I expected at least one to say something to confirm the reviews of the big media outlets. Nope. Everyone, including people who don’t like super hero films, liked it. So I went. There are a lot of Super Hero films out this summer. The Hulk, Iron Man, The Dark Knight and Hancock. The Hulk is an attempt to forget the 2003 version done by Ang Lee in which they do intense character development for an hour before having any superhero action (what???) and I couldn’t tell you if the new Hulk is any good or not because I didn’t bother to go see this one. I’m not a big fan of Ed Norton either so that was another reason to not go. I liked Iron Man. Mainly because Mr. Downey is such an interesting actor. The story however was pretty linear and predictable. It offered nothing new, honestly. The Dark Knight has had an incredible amount of hype associated with it as well as the tragic connection to Heath Ledger’s death. I will go see it to see his last major motion picture performance and because I liked the previous incarnation quite a bit. Anyway, back to Hancock. The movie was great. It has one very surprising twist in it which none of the other films that I’ve seen this year have had. The movie comes to a very good end and I think that it has a lot to say about remaking your life. I think, and this is just speculation, but I think that the real problem is that Will Smith has come out as a Scientologist. Now I am Catholic and a scientist. Yes, those are at odds most of the time. However, I noticed that Tom Cruise has gotten a ton of negative publicity and scorn over his Scientology beliefs to the point the Germans didn’t want to cooperate at first with him to make his movie Valkarie. You know what, replace Scientology with Judaeism. I honestly believe both of these men are being persecuted for their religious beliefs. Sure, people can say “oh he must believe in Xenu and all that crap.” To which I reply, is my religion any better? I believe in a Jewish Zombie who can make you live forever (if you symbolically eat his flesh), was his own father, who I telepathically call master, so he will remove an evil force from your soul that is present in humanity because a rib-woman was convinced by a talking snake to eat from a magical tree. To me the true value in any religion (in fact the only value) is in the allegory from which we derive lessons to lead our lives. So, given the film is very good (3.5 stars at least) and that Scientology is currently the most hated religeon in Hollywood (which on the other hand embraces Kaballah), shouldn’t we give Big Willy a break here? Go see the film. If you like superheroes you will like it. 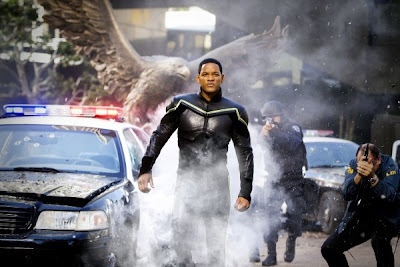 If you like Will Smith you will see yet another facet of his acting. If you just want to be entertained – go see it. It is not a train wreck, it does not loose steam towards the end, the story is really interesting. Enjoy! Isn’t that the truth. I was sceptical about MK’s batman but was blown away by the performance. I think that one movie really launched the superhero film industry to the level it is today. Those who can’t make movies, act or otherwise be in a movie end up being critics. IMO. A local journalist in Milwaukee Wi wrote an article that claimed the Micheal Keaton Batman wouldn’t be in the theaters for more than a week. A year later people were still chiding him in other papers.